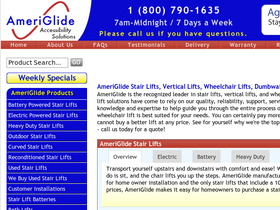 AmeriGlide, online at AmeriGlide.com, sells a variety of stair lifts, vertical lifts, and wheelchair lifts. AmeriGlide sells electric-powered stair lifts, battery powered stair lifts, heavy duty stair lifts, and factory reconditioned lifts. At AmeriGlide, you can also buy Express Dumbwaiters, Wheelchair Lifts, Bathtub Lifts, and walk in tubs. AmeriGlide carries wheelchair stair climbers, mobility scooters, stair lift batteries, and outdoor stair lifts as well. RetailSteal.com has the best AmeriGlide coupon codes, AmeriGlide discounts, AmeriGlide coupons, and AmeriGlide promo codes. Shipping and handling rates at AmeriGlide depend on the pricing of your purchase and your shipping destination. See website for full details. Exclusions may apply. Use this coupon code at Ameriglide.com and enjoy a 3% discount on your purchase. Purchase select lift chairs at AmeriGlide and get free shipping and one free year of in-home parts and labor. Click link to shop online. Save up to 35% off when you buy select Reconditioned Electric Powered Stair Lifts at AmeriGlide. Click link to purchase. Check out the weekly specials at Ameriglide and save up to 60% off a range of scooters and lifts. At AmeriGlide, buy stair lift batteries for as low as $71.99. Click link to purchase. Buy a select travel scooter for as low as $549.99 at AmeriGlide. Click link to purchase. Sell your used stair lift at AmeriGlide. Click link to find out how. At AmeriGlide, get free shipping, batteries, and in-home warranty with the purchase of select electric scooters. Click link to buy. Hurry over to SpinLife today and save up to 46% on heavy duty wheelchairs. Get $300 off on any Invacare Pronto Series power chair at SpinLife with the coupon code. Click link to buy. Save 36% on your online order of ROHO cushions at SpinLife. Click link to buy. At SpinLife, take 70% off rolling walkers when you purchase them online and get free shipping. Click link to shop. Pay as low as $99 for manual wheelchairs online at SpinLife. Click link to save.